The Warlpiri Media Association (WMA) is a non-profit community organisation based in Yuendumu, 300kms north-west of Alice Springs, Northern Territory. It is managed by a locally elected Indigenous management committee and also known as PAW Media and Communications. PAW is the abbreviation of the three language groups of that area, Pintupi, Anmatjerre and Warlpiri. WMA provides media services over a 40,000 km² area. Warlpiri Media employs Indigenous and non-Indigenous staff who create and broadcast local media as well as media for a broader regional and national audience. WMA's major area is video, both production and local transmission. In 2001 they launched the now popular PAW radio network, and also offer a music recording studio and the capacity to produce web based projects. The association has been in business since 1993 and celebrated its 25th birthday in 2008. One example of their fine video productions is the popular bush comedy Bush Mechanics. Find more information visit the Warlpiri Media website. Deadly Sounds is a Australia's only national weekly Aboriginal and Torres Strait Islander music program. It features music, culture, information and sport in a positive magazine format. Deadly Sounds supports a positive healthy lifestyle without too much alcohol and without drugs. The program features Aboriginal music from around the country, interviews with special guests from the fields of music, sport, film, theatre, dance and community achievement . It began in 1994 on just 12 stations  and is now broadcast through the community radio network as well as the National Indigenous Radio Service to almost 200 stations across Australia, and to over 70 remote stations. Deadly Sounds broadcasts to every state and territory in Australia. Most media in Australia targets western people. Advertisements for Aboriginal people, however, have to be different should their messages reach them. 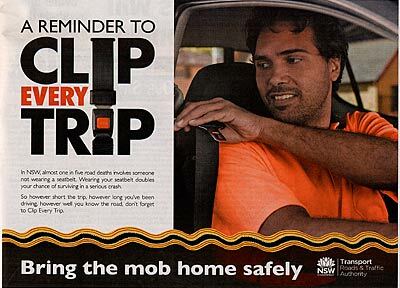 During 2011 the Roads and Traffic Authority of NSW ran a seatbelt campaign aimed at changing the behaviour of rural male drivers who forget to buckle up . While most ads showed white people, a print ad below targeted Aboriginal people. Note the use of the wavy decoration which incorporates colours typically found in Aboriginal art, and the prominent use of the Aboriginal word "mob" (used to address fellow Aboriginal people). Advertisement targeted to an Aboriginal audience. It uses Aboriginal art, colours, shapes and the word 'mob' to be culturally appropriate.